‘2020 Vision’ was a research project funded by EPSRC/AHRC as part of the ‘Designing for the 21st Century Initiative,’ developing design research over a five-year period from 2005-2009. 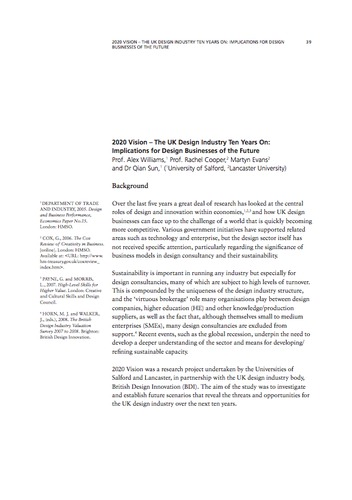 It investigated the threats and opportunities for the UK design industry over the next ten years, together with UK design industry body British Design Innovation. This book chapter, co-authored with Cooper and Evans of Lancaster University and Williams of Salford, disseminates the key findings of the project. It focuses on the distinctive needs of the UK design consultancy sector. The research was conducted in three stages: extensive literature review, preliminary focus groups; future scenarios developed in consultation with a panel of experts from different political, economic, social, technological, environmental and legal fields; and interviews and workshops on the impact of the various scenarios with three sets of stakeholders – design practitioners and design consultancies, design buyers/clients (private and public sector), and government, design association and HE representatives. These sessions explored the threats and opportunities posed by each scenario, to identify new, more appropriate models of practice. The research was complemented by a survey of designers and subsequent cluster analysis of survey findings. The findings present a model of the business context for design that identifies the driving forces in the market. 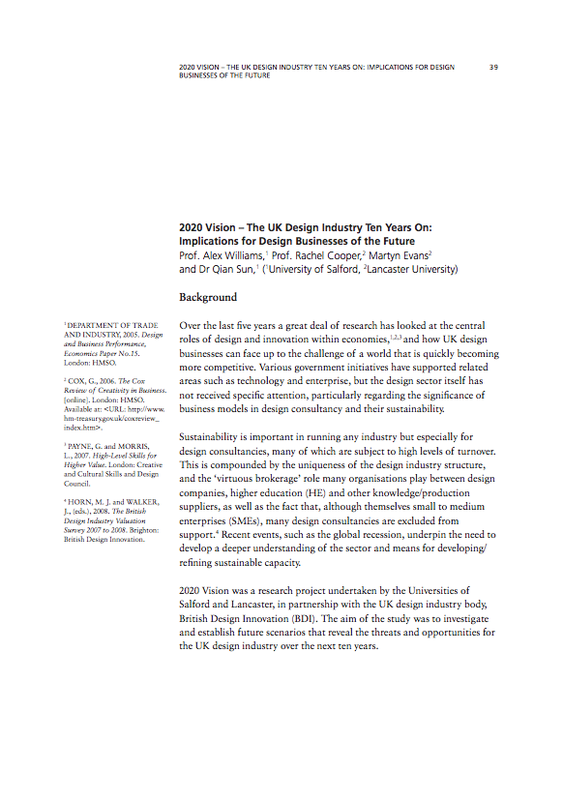 Aspects identified for further attention include: revising design education, a single professional body for accreditation, encouraging design companies to radically rethink their business models. The report has been widely referenced, e.g. Spencer et al. 2012 for UK Intellectual Property Office; Lalaounis et al. Design Journal 15(3); Alexiou et al. Embracing Complexity in Design, Routledge 2009. It led to industry and policy workshop with delegates from Design Council, NESTA, the RDAs and design commentators. Related work includes a conference paper for D2B2 Tsinghua International Design Management Symposium 2009, in Beijing, China.